When I was a kid we had a guava tree in our backyard. The fruit was the most common variety at the time – reddish, small, but very sweet. It was perfect for making Dulce de Guayaba (Guava Jam). Unfortunately it is not the type of guava that lends itself to mass production and sale, as it has to be picked ripe and spoils very fast. It’s been decades since I last saw one of those. Our guava tree wasn’t the only one in our backyard. My mom, frugal and practical like most Dominican moms, complemented our diet with fruits and vegetables that she grew in our backyard. This was actually the norm then, when most Dominicans, even in the cities, lived in houses with backyards. A significant percentage of Dominicans now live in cities, busy as they are, space is at a premium and most people now live in apartments. The tradition of growing fruits and vegetables at home is now a thing of the past for most urban dwellers. Anyway, let me share this dessert that I posted in our Spanish blog several weeks ago. Pasta de guayaba (guava paste candy) is very simple to make, requires few ingredients and is very popular in our country. 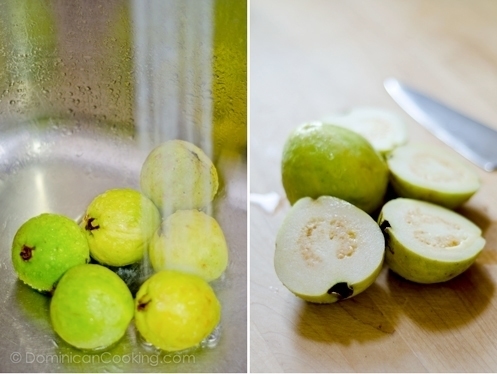 If you can find guavas where you live, try it – you’ll love it. There are several varieties of guava; each will make this dish slightly different, but in the end it doesn’t matter, the result will be just as good. 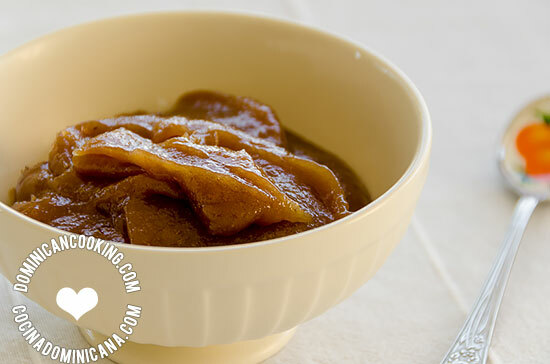 There are three ways of serving Dulce de Guayaba (Guava Jam): you can make it thick and let it harden, then cut it into cubes to be served as candies. And you can also use it as filling for the Dominican Cake, or this Ricotta and Guava Tart, or dilute with a bit of water to serve as sauce with the Auyama Flan. Whatever you do with it, it will make your desserts amazing and unforgettable. Dulce de Guayaba Recipe (Guava Jam): make it thinner for spreading on cakes or other desserts, or thicker and cut it into candy cubes. Blend the guava and the liquid left from boiling. Return to the pot, cook over medium heat stirring the pot so it doesn't stick to the bottom or burn. Be careful with splatters! What to do if it is too soft: Reheat again and cook stirring until it lifts from the bottom of the pot. What do do if it is too hard: Reheat again and stir in a tablespoon of water (or two) depending on the consistency you want (spreadable for cakes, more liquid as a sauce). Can this be frozen, or how long does it last in the fridge! I suggest you refrigerate it, not freeze it. I have used it for up to two weeks, it never lasted longer. Guavas are tropical and in Florida they sometimes have 2 growing seasons depending on weather. The primary season is late Summer/early Fall and secondary season would be spring. Thanks for the recipe! My family has guava recipies going back generations, but I’m going to give this a try. Would love to try this. Think that guava paste would hold up to being dipped in chocolate? Also, we don’t see guavas much in the stores on the west coast. Is there a particular season where they are at their best? To be honest, I don’t know when it’s guava season. While I am reasonably sure it will hold up to chocolate dipping, I am not sure those are two flavors that really go together. Guava has a delicate flavor and it would be drowned by the taste of chocolate. 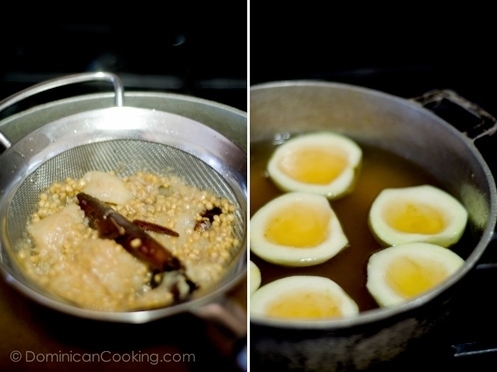 Wanting to make guava fruit leather. I’ve tried your recipe and it turned out great the first time around, so I’m going to go for it again! Brings back memories of my childhood and going to the the mexican candy mercados.